This past week we saw the start of some lower level snow melting! It didn’t melt a lot, but it definitely started. The high country is still packed with deep snow levels and the water situation looks very good for a solid fishing season! The forecast for the next 2 weeks shows some cold nights and day temps peaking in the mid 40’s so we should see a slow start to a run-off season, which means we think full run-off wont happen until late May! This leaves a solid early-season fishing window over the next couple months. Look for some rivers to start opening up in the next 2 weeks- boat ramp accessibility will probably be the biggest obstacle to floating the river once the water busts open. Give our shop a call and we can fill you in on the open sections on the New Fork and Green. The Lower Green below Fontenelle Dam has been fishing well- streamers and worms are the ticket to finding a few spring-fighting trout! 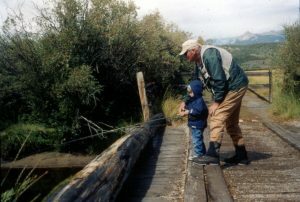 The Green River should start fishing late April or early May this year, so keep checking in with us about current conditions. Once the river breaks open we should have some really good fishing before the run-off. Streamer fishing can be very rewarding this time of the year, so if you’re looking to throw some big bugs and have a chance at the “fish of the year”- you may want to come out before the summer rush of anglers! The New Fork will open earlier than the Green, due to the controlled flows of this river. Once the ice clears off the river, there will be big browns and ‘bows waiting to start filling up from the cold, slow winter. Make sure you have plenty of streamer colors in your box, as this time of the year the fish can really be on and off certain streamers daily. The fishing is productive with streamers or nymphs alike. Our guides have been tying up their favorite patterns all winter and are ready to help you catch fish! Our guides are what make Two Rivers successful. We value them and understand that they are our connection from our shop to our clients on our fishing trips. We have, hands down, the best guides in Western Wyoming if you’re looking to fish the Green or New Fork Rivers. Our large Guide team ensures we can match you up with a guide that fits your fishing style, personality, or needs for the trip. Watch for some short “Get to Know Our Guides” videos over the next few fishing reports so that you can get a feel for our excellent team. This month we want to highlight guide Mike Kaul. Mike has been such a big part of our guide team and fly shop over the last 20 years. Mike is a world class fly fishing instructor, who can teach any angler how to improve their casting stroke. He is our lead walk/wade guide and knows every private lease Two Rivers has to offer like the back of his hand. 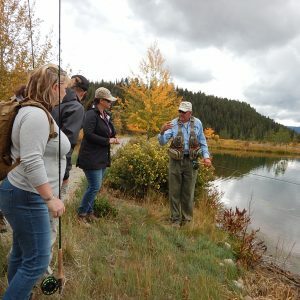 Mike teaches small to large group settings about fly fishing and casting every year, so if you have ever wanted to learn from a true professional, Mike Kaul is the man for the job. Mike owned and operated Two Rivers before the new ownership took over and has been a guide for over 20 years. 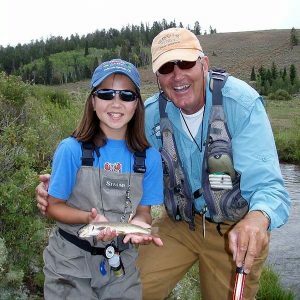 Come spend a day with Two Rivers and let Mike Kaul help you learn more about fishing the Pinedale Area. The Green River is running clear under the ice. We have great snowpack, but we still need a good month or so of winter to be able to predict the summer water conditions better! The New Fork is such a special stretch of water-the river is ice as of now, but this river always opens up before the Green and we will start fishing it in late March or early April! We can’t wait! A nice Colorado Cutty caught with Guide Mike Kaul! The Green River through Seedskadee is still open near the dam, but the current weather is hard to withstand, so we don’t guide on this section until spring. The start of the season on this tailwater is nearly here-we start to see some decent fishing on this river over the next month. If you’re interested in some early-season streamer or nymph fishing, this river is about ready! Ice fishing is in full swing and we have reports of some great fishing on Boulder Lake, Green River Lakes, and New Fork Lake. Til next time: Row On!